DC Matt has covered his experience at the Strasburg debut, and his seats were a lot better than mine and so are his photos. I’ll refer you to the experts for a break down of his performance, which unless you live under a rock you should be familiar with by now. What I did observe from the upper deck had more to do with baseball culture than a baseball game. For most people in section 408, this was not a game, it was an event. Washington has facetiously been referred to as “Hollywood for Ugly People,” and there was a little bit of that on display last night. The DC publication Politico seldom wades into sports, but this article does a good job illustrating how the game became something of a scene. The cheap seats were filled with young men and women who were too dressed up for baseball but not dressed up enough for work, with big sunglasses, Miller Lites, and and looks on their faces more suitable for a Coldplay concert than a baseball game. It is a scene that is very familiar around Washington today. There was a tremendous amount of energy in the ballpark when Strasburg was pitching, no doubt about it. Fans were mostly cheering at the right time, and people seemed to have a sense of what was unfolding particularly when Strasburg struck out the side in the 7th. Unfortunately, that energy was not sustained after he departed. Tyler Clippard and Matt Capps are solid receivers and they did a good job closing out the Pirates, but by that time a large portion of the crowd had departed. Washington is a town with a transient fan base. People (like yours truly) come and go, and largely keep their hometown allegiances. To really make it in this town, the Nationals need this kind of energy and “event” like atmosphere for a while. A pennant race could be very energizing, but only time will tell. Phil Hughes has gone six innings and two thirds without giving up a hit. If he goes all the way he’ll be the first Yankee pitcher to throw a no-hitter since David Cone’s perfect game in 1999. Hughes has walked just one guy. Naturally, Jersey Matt and I dropped Hughes from our fantasy team about a week ago. And he just finished the seventh. He’s at 87 pitches. The guys on the MLB Network are talking about how important it is to watch Hughes’s pitch count because Joe Girardi (who caught that perfect game by David Cone, by the way) is notorious for strictly adhering to pitch count limits. Girardi made some headlines when, after a game in which CC Sabathia lost a no-hitter in the 8th inning against the Rays, Girardi said he would have taken Sabathia out after the 8th inning regardless of whether he still hadn’t allowed a hit. Now, yes, the pitch that yielded the line drive to Kelly Shoppach was CC’s 111th pitch. But it’s CC Sabathia! Last year he threw over 100 pitches in a game twenty-seven times. * Also, he’s a veteran. He’s known to throw a lot of pitches. In fact, in his career he has thrown over a hundred pitches (are you ready for this?) two hundred and ten times. I have to believe that Girardi just said that to maybe make a point. I have to believe that as a former catcher, especially one who caught a perfect game, he would let his guy stay in there. Over and above everything else, you have to let a guy go for the no-hitter – not to mention the Yankees were leading 8-0 at the time. Ridiculous. Some quick fun facts that can only happen in baseball. Shoppach, who broke up CC’s no hitter, was CC’s catcher when they both played in Cleveland. When Cone pitched that perfect game in 1999 the opposing pitcher that day was a 23-year old right hander named Javier Vazquez. Girardi of course also caught Doc Gooden’s no-hitter in 1996 against the Mariners, who were batting a young Alex Rodriguez second (Jeter was hitting 9th for the Yankees). Gooden threw 134 pitches that day. Good thing Girardi was catching and not managing. On to another pitcher. Stephen Strasburg made his third start for the Harrisburg Senators today (I guess technically yesterday, now) which I unfortunately couldn’t make it up to Harrisburg for. In 5 innings he gave up one hit and one walk with 6 Ks. He threw 68 pitches, 48 of them strikes. His first pitch of the day was 98 mph. He threw ten pitches total in the first inning, seven of them strikes, and zero of them – zero – were below 95 mph. So far he’s pitched 12 and a third innings and given up 1 ER, 7 hits, 3 BBs, and 17 Ks. The train is coming. Jason Heyward’s first at-bat against Strasburg may be very, very exciting for me. Nats won again tonight, against Colorado. Are the Nats for real? * At the beginning of the season I declared that if they got through April with 11 or 12 wins they’d be in great shape, not only as far as their record goes but they would have shown that they could hang with the big kids (their April schedule has 6 games against Philly, 3 against Milwaukee, 4 against Colorado, 3 against the Dodgers, 3 at the Cubs, 3 at the Mets, and 1 against Florida). Now, the Cubs and Mets look dreadful, Colorado does not look like the division champ many people predict them to be, Milwaukee doesn’t look great either, and they did go 2-4 against Philly. So maybe this blazing 8-7 start says more about the competition than about the Nats themselves, but if that’s the case then they’re at least beating someone. Last year after 15 games they were 3-12 (after starting 0-7). So this is good. Does that get them above the fold in the Sports section of their hometown paper, the Post? Of course not; they were pushed down by a story about some Redskin that didn’t come to off-season workouts. Obsess over politics all you want, this to me is a clearer sign this town has its priorities upside down. Tomorrow I will be in Nationals Park in the 8th row right on top of the Rockies’ dugout – $70 seats. However, since it’s the Nationals (and they’re not very good and this isn’t a baseball town*) and the Rockies (who have no diaspora whatsoever), my buddy and I got the tickets for $26 each. Our goal is to get the $300 President’s Club seats (right behind home plate, food and drink vouchers, etc.) for $50. Next post will have links. Need to catch up on those. Good stuff lately from Posnanski, Hardball Times, and of course the famous Forbes article. Also, at a later time we’ll look at a fun, obscure metric called Offensive Winning Percentage. Last Sunday I drove to a small town in Pennsylvania, where my car promptly broke down. (Very promptly, in fact. As I was pulling over to the exit the engine began to smoke.) I ended up spending the night in Pennsylvania, missing work on Monday, and paying $300 to have the car fixed. But none of that matters for what, really, is a silly reason. None of it matters because the town was Altoona and my destination was Blair County Ballpark, home of the Altoona Curve. On Sunday they were hosting the Harrisburg Senators and a guy named Stephen Strasburg was making his first professional start. Strasburg is a highly touted blah blah blah you know the story. When my buddy at work told me that the Washington Post had announced that Strasburg’s debut would be on April 11, I was on the Curve website within about 10 seconds to buy tickets to the game. * I don’t know why that was my reaction. I had been to Altoona a couple times before, so I knew it was a three hour drive from DC. I knew that the game would be covered extensively on TV. I knew that when he eventually gets called up, I’ll see Strasburg pitch in DC. I don’t know why I had, just had, to go to the game in Altoona. But I did. So I bought tickets in the second row behind home plate, which sounds lavish until you realize that each ticket was $12 including the service charge. Gotta love minor league baseball. We decided to get food before the game, a decision that almost made us miss the first pitch of the bottom of the inning – Strasburg’s first pitch. I had the same urgency to run down to the mezzanine to see the first pitch as I did when I bought the tickets. I don’t know why I did it. He would throw more pitches, so what was the big deal? I didn’t know, but I couldn’t stop it. I ran down the stairs and stood behind my section. Ball one. An inauspicious start. It took him 24 pitches to get through the first inning, wherein he gave up a run. And I know I should consider the shaky first inning when evaluating the whole start, but I won’t. When I remember that game, I will remember the second, third, and fifth innings. They were spectacular. Check out this view. Strasburg is amazed at his own fastball speed. 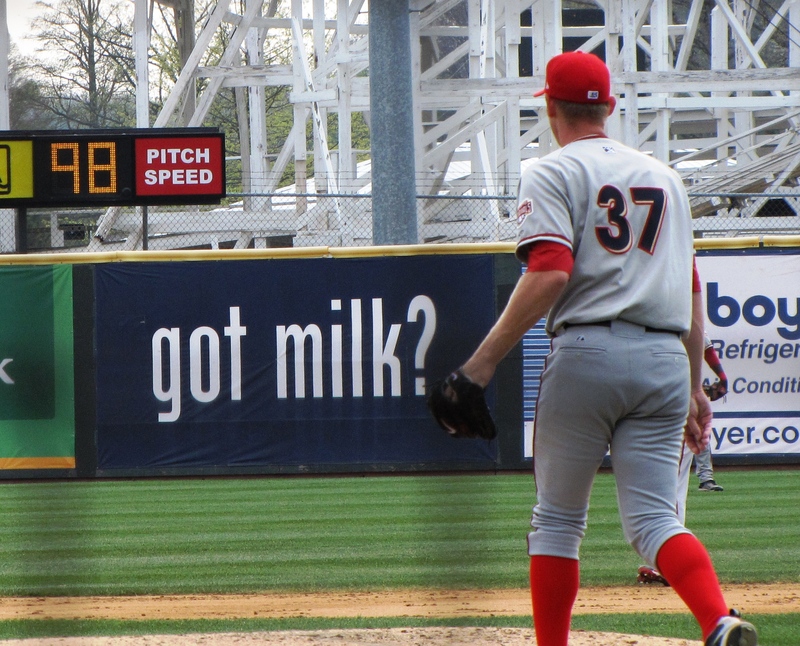 Check out the speed clock you can see beyond Strasburg in center field. I was fixated on that clock as it repeatedly read 97, 97, 96, 95, 97, 98, and other numbers that made me murmur repeatedly to myself. * Well, there’s a funny thing about that speed clock in Blair County Ballpark that I didn’t find out until later. It is consistently 2 miles per hour slow. I am a big believer in the ability to use numbers to tell whatever story you want; exploit strengths and hide weaknesses, etc. The only way to avoid accusations of bias is to offer the entire universe of numbers available to you. Well, that table is the entire universe of numbers of Strasburg’s second inning. There’s nothing more to say. I mean, just look at that pitch sequence. Look at it again. I mean, really. What is that? That last pitch in the fifth was his last of the game, his 82nd pitch. His 82ndpitch – 99 miles per hour. There’s no need to exaggerate these numbers. He looked as dominant as the number suggest. I don’t want to say that the absurdly fast fastballs looked effortless, but they looked like reasonable pitches, like he was throwing 90. Here is his sixth pitch of the second inning, a 99 mph strike. They say this guy is ready for the majors. I’ve even heard about one scout saying that right now Strasburg could pitch in the MLB All-Star Game. I don’t know about all that but I do know what I saw. The guy is an animal. His overall line for the game ended up being 82 pitches, five innings, four hits, four runs, one earned run, two walks and eight strikeouts. That’s a great but not magnificent start overall, stats-wise. Maybe I’m just drinking the kool-aid but I have to believe that the couple of negatives that there were (the two walks were ugly – 5 pitches each – and both drawn by the same hitter) can be corrected and overcome. I don’t think he’ll throw no-hitters every time out, and I know he’s going to walk people, but I don’t want to believe it. I want to believe he’ll strike out ten every game and never walk anyone. I want to believe he’ll hit 98 and 99 mph fifteen times a game, and his last pitch will always be triple digits. I want to believe he’ll win 20 games every year for 15 years and that he’ll make people rethink proclaiming that we’ve seen our last 300 game winner and that no one will ever approach Nolan Ryan’s career Ks or Pedro’s 2000 season.